These cauliflower bread sticks are a great, low carb alternative to bread sticks and garlic sticks. I get a lot of requests from my followers to post low carb recipes with cauliflower. Cauliflower can be used in a lot of recipes to replace rice, potatoes, bread and other things. I must admit that before I started a ketogenic diet I really didn’t eat cauliflower at all. That has definitely changed now and I use it quite a bit. Now that I started cooking with it more my kids are loving it too. I use it a lot of the time as a replacement for potatoes. My kids actually like it more than potatoes. We mash it up and top it with butter and it’s delicious. There are so many things you can do with cauliflower. 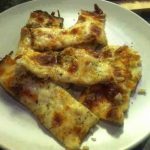 If you find yourself having a cravings for bread sticks or garlic fingers this is a great alternative! I love to make these for a snack or lunch. They are yummy as is or you can dip them in a low carb marinara sauce or some ranch. 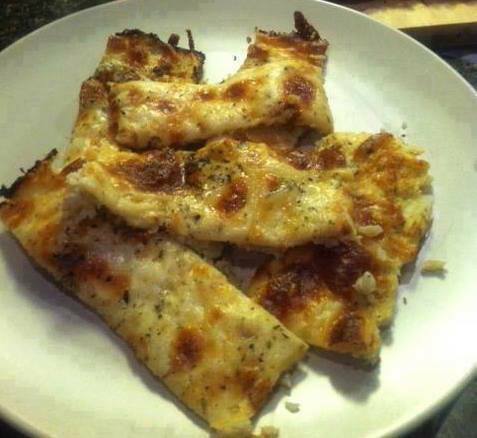 I also like to add some crumbled bacon on top of mine and they are amazing! I’m sure you’ll love this recipe because it’s one of my favourites! Cut up cauliflower and cook in microwave until tender enough to be chopped up in a food processor. Chop up cauliflower in food processor. Bake at 450 until edges brown (about 20 minutes). Add more cheese on top, bake until bubbly and browned to your liking. Cool for 5 minutes and cut with pizza cutter. Dip in marinara sauce of choice! Must try these…and especially glad they can be frozen. Too much fresh cooking on this diet…LOL.